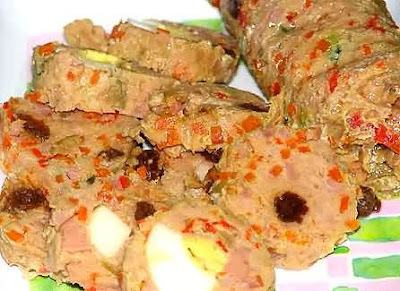 They said that “embutido” means that it is wrapped with the skin of the pig's intestines. But this embutido is just wrapped with an aluminum foil because my family especially my hubby doesn't like to eat food that contains internal organs of the animals. Embutido can be served as cold cuts; lightly pan a sliced pieces or fried the whole then sliced. It is also best that you dip a slice of embutido with your favorite food sauce. As for me, my favorite is the sweet chili sauce while my kids love to dip it with ketchup. Hmm…delicious... Enjoy!! !